For other ships with the same name, see HMS Diamond. HMS Diamond is the third ship of the Type 45 or Daring-class air-defence destroyers built for the Royal Navy. She was launched in 2007, completed her contractor's sea trials in July 2010 and arrived at her base port on 22 September 2010. Diamond was commissioned in a traditional ceremony on 6 May 2011, and formally entered service on 12 July 2011. Diamond's construction began at the BAE Systems Naval Ships yard at Govan on the River Clyde in February 2005. She was launched on 27 November 2007. By July 2010, Diamond had been fully fitted out and finished her contractors' sea trials (stage 1 trials). She arrived in her base port of HMNB Portsmouth on 22 September 2010. Diamond was commissioned in a traditional ceremony on 6 May 2011 in her home port of Portsmouth. The ceremony was attended by the ship's sponsor and the Commander-in-Chief Fleet Admiral Sir Trevor Soar. Diamond continued undergoing sea trials until she entered operational service in July 2011 after the completion of her trials. The ship conducted operational training before commencing her first overseas deployment. Diamond is commenced her deployment in the summer of 2012, starting with celebrations to mark the Diamond Jubilee of Her Majesty Queen Elizabeth II. Diamond was in the Middle East Area of Operations in 2012. During Operation Recsyr in February 2014 she escorted MV Ark Futura carrying chemical agents from Syria. On 8 May 2017, Diamond fired an Aster 30 off the coast of Scotland. On 4 September 2017, Diamond sailed for a 9-month deployment to the Middle East, initially scheduled to relieve HMS Monmouth, she was instead diverted to take over as flagship of Standing NATO Maritime Group 2 from sister HMS Duncan when her intended relief, HMS Ocean was redeployed to provide relief to British Overseas Territories in the Caribbean in the wake of Hurricane Irma. Diamond was relieved of her NATO duties upon the return of Ocean from the Caribbean on 30 October and resumed her planned deployment to relieve Monmouth. However on 23 November, The Times reported that Diamond was being forced to abandon her deployment and return to Portsmouth early due to mechanical issues, which was later confirmed by the Ministry of Defence. As part of her affiliation with Coventry, Diamond will carry a cross of nails created from the remains of Coventry Cathedral. At the end of the Second World War a cross of nails was created out of the wreckage and has been presented to all ships that carry the name Coventry. It was recovered from the wreck of HMS Coventry by divers after she was sunk in the Falklands War and presented to the crew of Diamond on her commissioning by Captain David Hart-Dyke, the commanding officer of Coventry at the time of her sinking. The City of Sheffield was offered affiliation to Diamond, but this was turned down by Sheffield City Council and the Lord Mayor, who want the city associated with another HMS Sheffield. The affiliation has now been transferred to the City of Coventry. ^ The Harpoon missile is to be fitted to four of the six ships. HMS Duncan is to be the first. ^ "HMS Diamond". Clyde-built Ship Database. Retrieved 21 June 2009. ^ "HMS Diamond to join fleet". The News. 4 May 2011. Retrieved 6 May 2011. ^ "Doff your caps to Diamond". Navy News. 8 October 2010. Archived from the original on 8 June 2011. Retrieved 23 May 2011. ^ "Call Sign Book" (PDF). Combined Communication Electronics Board. Archived from the original (PDF) on 18 July 2011. Retrieved 8 October 2010. ^ "World Shipping Register - Ship Index". Archived from the original on 31 May 2011. Retrieved 12 July 2009. ^ "Type 45 Destroyer". Royal Navy. Retrieved 6 November 2011. ^ "HMS Daring leaves Sydney after spectacular week of celebrations". Royal Navy. Retrieved 13 October 2013. ^ "For Queen and Country". Navy News (July 2012): Page 8. One hundred or so miles west of the largest city of Abidjan lies the fishing port of Sassandra, too small to accommodate 8,500-tonnes of Type 45. ^ "HMS Duncan joins US Carrier on strike operations against ISIL". Navy News. Royal Navy. 7 July 2015. Retrieved 9 July 2015. As well as supporting the international effort against the ISIL fundamentalists – the 8,500-tonne warship has also joined the wider security mission in the region. ^ "HMS Daring". Wärtsilä. Archived from the original on 28 October 2014. Retrieved 1 August 2011. 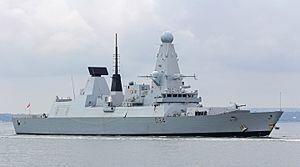 ^ a b "HMS Daring - Type 45 facts by Royal Navy.pdf". Retrieved 22 July 2016. ^ "Raytheon Press Release" (PDF). 8 March 2006. Archived from the original (PDF) on 13 March 2012. Retrieved 31 January 2008. ^ "Jane's Electro-Optic Systems". 28 October 2010. Retrieved 21 August 2011. ^ "Fleet to get the latest in electronic surveillance" (PDF). DESider. Ministry of Defence. September 2012. p. 18. Archived from the original (PDF) on 5 September 2012. ^ "UK to buy Shaman CESM for Seaseeker SIGINT programme". IHS Janes Defense. 29 June 2014. ^ "HMS Duncan (D37)". Royal Navy. ^ "Air Defence Destroyer (T45)". Royal Navy. Archived from the original on 31 October 2007. Retrieved 20 November 2007. ^ a b "Navy's newest ship will carry a poignant reminder of the past". Portsmouth News. 7 May 2011. Retrieved 7 May 2011. ^ a b "HMS Diamond enters service". Ministry of Defence. 12 July 2011. Retrieved 28 October 2014. ^ "Destroyer launches on Clyde". BBC. 27 November 2007. Retrieved 27 November 2007. ^ "HMS Diamond welcomed in Portsmouth with ceremony". BBC News. BBC. 6 May 2011. Retrieved 7 May 2011. ^ "HMS Diamond". Royal Navy. 2014. Retrieved 28 October 2014. ^ "HMS Diamond marks Jubilee with Portsmouth celebrations". BBC News. 1 June 2012. Retrieved 28 October 2014. ^ "HMS Diamond shows Type 45's potent firepower in high sea missile test". www.royalnavy.mod.uk. Retrieved 12 November 2017. ^ "HMS Diamond sails for the gulf for nine month operational deployment". Royal Navy. 2017. Retrieved 5 September 2017. ^ "HMS Ocean assumes NATO flagship role in the Mediterranean". Royal Navy. 2017. Retrieved 24 November 2017. ^ "HMS Diamond aborts Gulf mission after breaking down". The Times. 2017. Retrieved 24 November 2017. ^ Baldwin, Harriett (12 December 2017). "HMS Diamond:Written question - 117262". UK Parliament. Retrieved 12 December 2017. ^ a b c d e f g "HMS Diamond Affiliations". Royal Navy. 2011. Archived from the original on 13 April 2011. Retrieved 28 October 2014. ^ "Give us our HMS Sheffield". Sheffield Star. Archived from the original on 23 December 2007. Retrieved 11 March 2009. ^ "Agenda of Meeting of Sheffield City Council, Wed 6 June 2007 (Article 10)". Sheffield City Council. Archived from the original on 6 September 2008. Retrieved 11 February 2008. ^ "Navy broadside for city ship bid". Sheffield Star. Archived from the original on 23 December 2007. Retrieved 11 March 2009. Wikimedia Commons has media related to HMS Diamond (D34). This page was last edited on 24 April 2019, at 19:17 (UTC).